Travelling through the Anchorage airport? 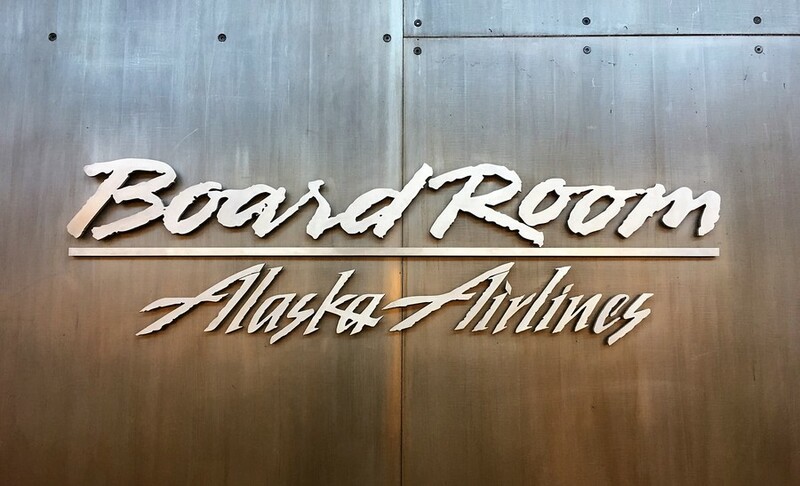 Our Mat Maid Milk Stout is now on tap in the Alaska Airlines Boardroom! One beer, of course, does not a “flight” make, but we guarantee it will take you to your happy place. It’s a good way to start off a trip outside, or add a proverbial nightcap to a journey back home. One night Head brewer Jake had a dream. A ghost-cow from the old Matanuska Maid creamery appeared. “Eee-eye-eee-eye-ohhh,” it said, which Jake interpreted as “Brew a milk stout.” Awaking in a cold sweat he wrote out the cow’s instructions word for word. True story. The recipe the cow gave him calls for huge amounts of caramel malts and roasted barley, along with a hefty dollop of milk sugar, to give you a stout that’s dark, full-bodied, and velvety smooth. Notes of roast coffee, chocolate, and heavy cream. Udderly delicious. 6% ABV. 27 IBU. To crown this awesome new location for the Milk Stout, Sallee Baltierra, the amazing concierge with Alaska Airlines, teamed us up with our good pals at the Inlet Towers Pubhouse to put on a launch party. Chef Daniel and his crew laid out a heck of a spread, including a ploughmans platter full of several cheeses, charcuterie, fruit, nuts, and organic bread, and a mezze board of hummus, baba ghanoush, harissa, pita, and playful accompaniments. Yum. The launch party gave us the chance to meet good folks from all over Alaska and all over the country. Many of them were anglers heading out to do some fall fishing, and we hope we set them up with some good refreshment before they took off to harry the finny denizens of our rivers and lakes. In addition to our stout we threw in two other beers for the party: our Frontiersman IPA and our Sluice Box Belgian. These beers, along with the stout, are available in several fine establishments across Anchorage, including the nearby Pubhouse at Inlet Towers. And to get a pint at the Pubhouse you don’t even need to buy an airline ticket first.